Services for Commercial Furniture Upholstery in Portland, OR for Restaurants, Bars, Hotels, Hospitals, and other Institutions. 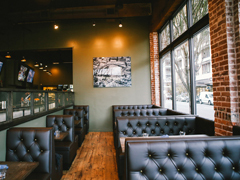 We build and upholster Restaurant Booths, Bar Stools, Benches, Chairs, and more! Links and resources for commercial and residential furniture upholstery supplies in Portland, OR. We are located in SE Portland close to downtown Portland, Oregon. We have over 40 years experience in restaurant booth upholstery and commercial furniture. Contact us today! In partnership with In-Ex Upholstery Supplies - Portland's upholstery supplies distributor.